Hearing the call of the dirt, tromping through snow to the garden tunnel. 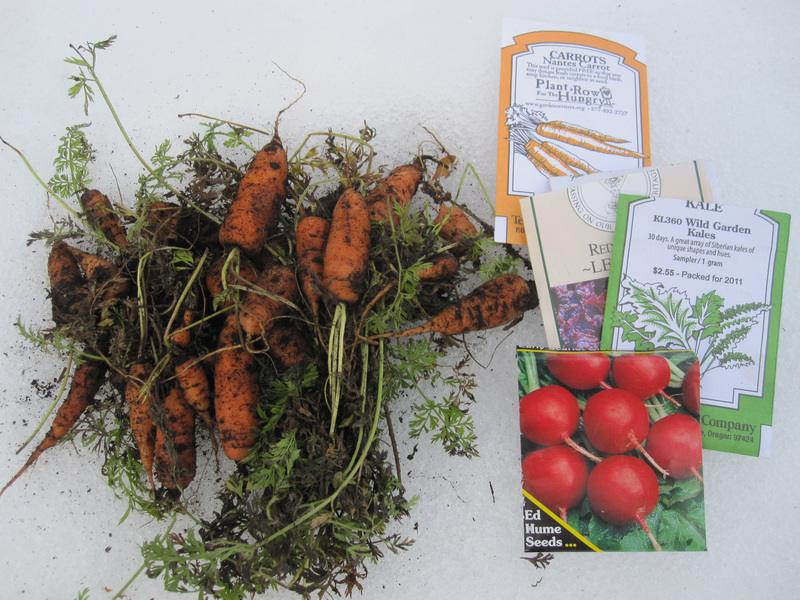 The soil has thawed and I clawed up some carrots that had wintered over. I’ll clean them and cook a few to see how sweet they are. For fun, I scattered some lettuce, kale, and asian green seeds, as well as a few radishes. Just curious to see what happens as the strengthening sun hits the plastic of the tunnel. Soon I’ll be able to plant this year’s carrot crop. This afternoon I ordered seeds from Irish Eyes Garden Seeds. In the spirit of experimentation, I like to try new seeds every year along with the old standbys. I am unable to resist tomatoes with odd names, or varieties developed for subarctic regions. The quest for bumper tomato crops in upper Kittitas County continues (I know I’m dreaming). Lettuce does grow well here, and I am just as susceptible to the names. The variety of shapes, colors and names is a wonder and delight, not to mention the daily salads I enjoy from April to October. Most of the flowers in my garden are perennials, but I enjoy growing annuals too. I’m sending for zinnias, nasturtiums, four o’clocks, and sunflowers. The more the merrier. If only I had a bigger garden, I could really overextend myself! I’ve been poking around the yard, exploring for sprouts. One snowdrop sprig is climbing up out of decaying daylily leaves, and there are lots of larkspur seedlings along the south side of the house. Snow remains in the yards of Cle Elum, but pussywillows emerge and robins fly around. March will be here in a week. What will you grow this year? Try one new thing–for me it will be Brussels sprouts. Deb, you sent me scurrying for my accumulating stash of seeds… in looking through them, I was kind of startled to note that I have as many new things to try as I do my stand bys: from Scheeper’s, there’s Water Cress, Malibar Spinach, Bitter Melon. From Hart’s, there’s Ornamental Corn, Scarlet Runner Beans & Spaghetti Squash. Brussels Sprouts were my last year’s experiment… they turned out small but VERY tasty. In reading about yours, I’m starting to yearn for a poly garden tunnel, too.